What would busy families do without the invention of the crock pot? I know I would sure be in a pickle on those busy nights I am desperate for something I can throw together quickly. These Philly Sandwiches are one of my go-to meals that my family loves and it comes together in just a few minutes. The hardest part about this recipe is remembering to throw the roast in the crock pot before you get going on your day. The meat cooks low and slow and is so tender and full of flavor. 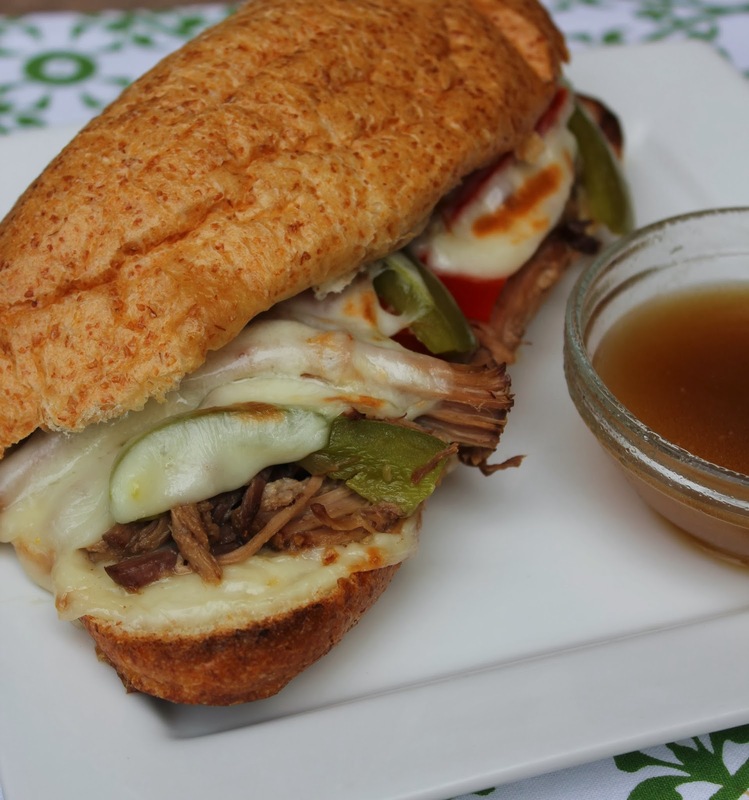 The peppers and onions give the sandwich some substance and great texture. Dip it all in the juices from the roast and you have a meal that takes very minimal effort and is totally delicious! In a crock pot place the boneless beef roast on the bottom of the pot. Pour 1/4 cup of water on the bottom of the pot. Sprinkle on the roast the beef bouillon and Montreal Steak Seasoning. Turn the crock pot to low heat and cook for 6-8 hours, or high heat for 4-6 hours. Thirty minutes before you are ready to serve dinner slice all of the vegetables. Shred the roast into pieces and let it soak in the juices. Add the sliced peppers and onion to the meat, stir and let continue to cook for 30 minutes. To serve the sandwiches place a generous portion of meat and vegetables on one side of the hoagie bun. Place a slice of cheese on top of the meat. If you want you can broil the sandwich to get the cheese golden brown. Serve with a side of the extra juices from the meat mixture and dip the sandwich into it.